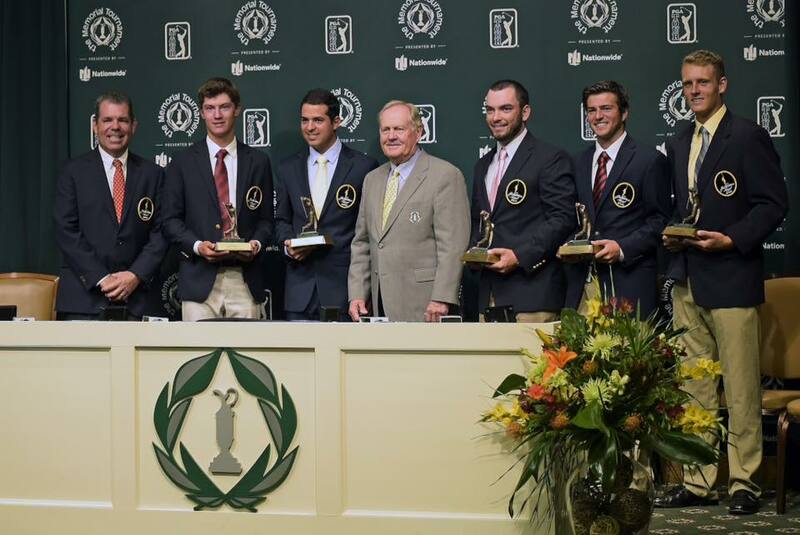 Tom Murray, President and CEO of Perio Inc., parent company of Barbasol, and Jack Nicklaus with Jack Nicklaus Award nominees: Maverick McNealy, Stanford – Division I; Santiago Gomez, Nova Southeastern – Division II; Sean Elliott, Dalton State – NAIA; Anthony Maccaglia, Oglethorpe – Division III; Kerry Sweeney, Eastern Florida State – NJCAA. Norman, Okla. — The 24 honorees for the 2015 All-Nicklaus Team presented by Barbasol have been announced by the GCAA. Players from Divisions I, II, III, NAIA and NJCAA were recognized for their outstanding play during the past collegiate season. The All-Nicklaus team comprises Bryson Dechambeau of SMU, Dalton State’s Sean Elliott, Santiago Gomez of Nova Southeastern, Lynn’s Mateo Gomez, Gavin Green of New Mexico, Southern Nazarene’s Michael Hearne, Beau Hossler of Texas, William Woods’ David Houlding, Cory Howard of La Grange, South Mountain’s Connor Klein, Anthony Maccaglia of Oglethorpe, Georgia’s Lee McCoy, Stanford’s Maverick McNealy, Grant Motter of Mississippi Gulf Coast, Washington’s Cheng-Tsung Pan, Arizona State’s Jon Rahm and Max Rottluff, LaVern’s Kelby Scharmann, Georgia Tech’s Ollie Schniederjans, Robby Shelton of Alabama, Vanderbilt’s Hunter Stewart, Kerry Sweeney of Eastern Florida State, Coastal Georgia’s Alistair Tidcombe and Midland’s David Wicks. Barbasol, America’s #1 Men’s Shaving Cream brand, was introduced as the first “brushless” tube of shaving cream in 1919. Currently offered in 7 varieties, Original, Soothing Aloe, Pacific Rush, Sensitive Skin, Skin Conditioner, Arc¬tic Chill and Mountain Blast, Barbasol continues to be made in America and is available at major retailers nationwide. Barbasol is owned by Dublin, Ohio based Perio Inc. For more information about Barbasol, please visit barbasol.com.